BT claims to have built the UK’s “first practical quantum-secured high-speed fibre network“, which harnesses quantum encryption and can transfer data at a speed of 500Gbps (Gigabits per second). The network runs over a distance of 120km via multiple exchanges between BT Labs in Ipswich and Cambridge University. Quantum links are often said to be virtually “un-hackable” because they rely on the use of single particles of light (photons), to transmit data encryption ‘keys’ (Quantum Key Distribution) across the optical fibre. Should this communication be intercepted, the sender will be able to tell that the link has been tampered with and the stolen photons cannot then be used as part of the key, rendering the data stream incomprehensible to any hacker. Admittedly this doesn’t stop hackers breaching the connection indirectly, such as by infiltrating the systems on either side of the link itself. Otherwise any data that passes over the link itself should remain secure and safe from prying eyes. “With the huge growth in cyber-attacks across the UK, it’s more important than ever before that we continue to develop ways to protect the most critical data. The new network, which forms part of a collaborative project led by the Quantum Communications Hub (part of the UK National Quantum Technologies Programme), was constructed by researchers from BT, the University of York and the University of Cambridge over the past two years. According to BT, the work was co-funded by the Engineering and Physical Sciences Research Council (EPSRC) and will connect to the Cambridge Metropolitan QKD Network being launched tomorrow in Cambridge. In the future it’s hoped that such networks could be deployed to help secure critical national infrastructure, as well as to protect the transfer of sensitive medical and financial information etc. The partners are using equipment from ID Quantique to transmit the data encryption key using a stream of single photons across the fibre network. 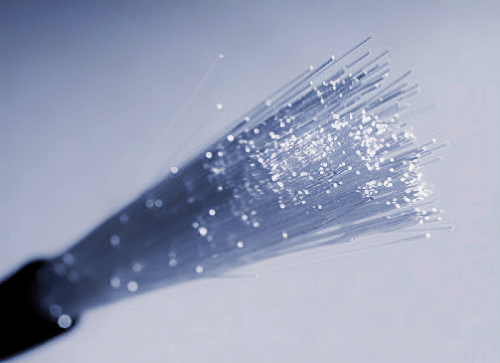 In parallel, the encrypted data flows through the same fibre, powered by equipment from ADVA optical networks. The fibre runs from Cambridge University Engineering Department’s Centre for Photonic Systems via quantum ‘repeater stations’ at Bury St Edmunds and Newmarket before making its way to the BT Labs. Obviously this is aimed more at major national or even international connections rather than domestic broadband ISP links. Quite interesting that this has been made to work at this sort of throughput. Be interesting to understand a bit more of the error rates and error corrections as single photons could not, when I was doing research, be 100% reliability detected. If the 500Gb/s is corrected data that would be really impressive. If it is the aggregated streams to allow for ultimate correction that is still interesting. The idea dated back to the early 80’s if memory serves well and was a response to various attempts at splicing into phone networks by both sides in the Cold War. The famous Berlin tunnel being a prime example. And various submarine attempts to splice into the Russian military phone network in the Baltic. All sorts of other approaches were used historically including pressurising the cable sheaths (also to keep moisture out). In common with other systems like this it uses quantum key distribution, the actual encrypted data uses classical encryption. The new thing is that level of throughput on the same fibre while still being able to carry out QKD. Meanwhile in the real world my upload speed is 0.03mbs and I’m the very last on a long list of 8 different stages to upgrade homes to fibre. I expect even 5G will be a thing of the past by the time you give me fibre. That has about as much to do with this article as the Singapore summit between Trump and Un. Same here Adam hell will freeze over before BT/Openreach give my area fibre. If faster broadband is that important to you, what are you doing about it? Or are you just waiting for someone else, in this case Openreach, to fix it for you?